Over at Fox News today, there was an article about a couple who live next door to a shooting range and their allegation that a stray shot grazed the wife’s head. Every shooter and range operator must take seriously the risk associated with bullets leaving the range property and landing somewhere they are not supposed to land. Whether pistol or rifle bullets, the matter is not a laughing one. 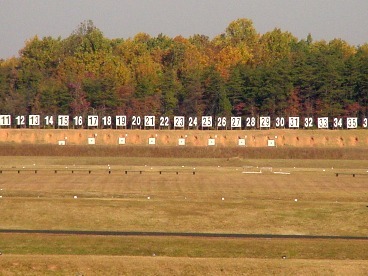 Muzzle discipline and the fundamental rules of range safety must be followed — every time you go to the range. How far will a rifle bullet travel? Thousands of yards. The maximum dangerous range for Military issue M-118, 175-grain, .308 Ball ammunition is specified as 5000 yards (almost 3 miles). Low angle impacts can cause a bullet to skip and go somewhat further. Because of this, shooters must be aware of (1) the boresight zero of their firearm, (2) their target and what’s behind it, and (3) where the gun is pointing at all times. It takes only a slight elevation of the gun’s muzzle above the horizontal to create the possibility that a bullet will overfly the target and possibly the backstop — and causing mayhem well downrange. How many degrees of muzzle elevation is needed to overfly a backstop? According to calculations at accurateshooter.com, five to seven degrees (5° – 7°) of up-angle will have a typical .30-caliber hunting bullet landing over 1.5 miles away. 1° = 60 minutes of angle. 5° = 300 minutes of angle. 1 minute of angle = 2″ at 200 yards. 300 minutes of angle x 2″ = 600 inches or 50 feet (600/12=50). Because most ranges do not have a 50-foot or taller berm behind their target lines, the margin of error is significantly less. As backstop height decreases, so does the critical angle. At 20-30 feet tall, you only need raise a rifle 3° above horizontal to overfly a 30′ backstop. Miss that 30-foot backstop and your bullet could land 1-mile away or more.